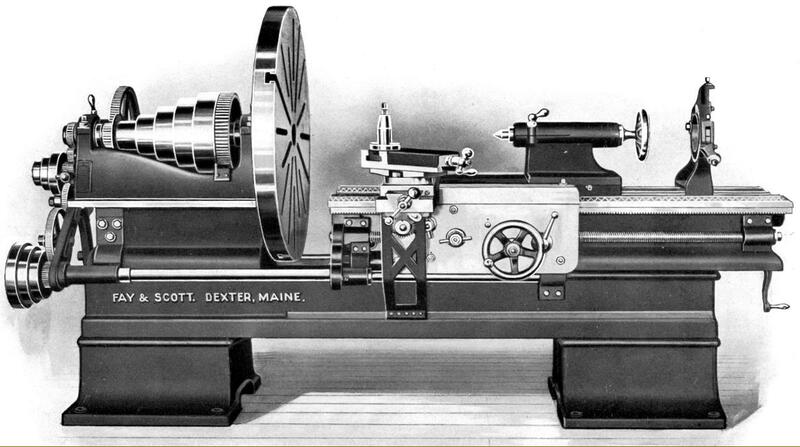 Designed to turn wood, the simple pattern maker's lathes were, nevertheless, very well built and all (except the 10-inch) fitted as standard with a screw-feed compound slide that enabled the finest quality work to be produced. Heavily built and using bronze bearings (often referred to as "boxes" in contemporary literature) the headstocks were fitted with a simple sump lubrication system with the oil raised into the bearings through wicks that ensured (should any dirt have worked its way into the sump) only clean oil was drawn up into the bearings. The spindle end thrust was taken against a hardened screwed ring, fibre washers being imposed between it and the bearing. The headstocks of some models - but not the 16-inch or larger - were able to be swivelled a few degrees either side of centre. Made from high-carbon steel, finish ground and bored through, the headstock spindles on most of the smaller models extended right through the left-hand bearing and carried a faceplate on their outer end for large-diameter bowl turning. Although no turning rest was fastened to the end of the bed, the makers provided a heavy floor-standing rest - which could be bolted down or left loose and levered into the most advantageous position for the job in hand. The Fay & Scott rest was not as heavy as some - the biggest, by makers like Wadkin in England and Oliver in the USA, were so massive that they had jacks and wheels built in to ease their positioning. Turned on both its inside and outside surfaces for better balance, the 5-step headstock pulley - or cone - had its smallest diameter arranged to be against the all-important front bearing - so allowing that to be larger and built onto a greater mass of supporting iron. Unfortunately the company appears not to have taken full advantage of this design feature for, beneath the smaller pulleys, the gap to the headstock casting was rather greater than it needed to be. Each lathe was supplied with a large faceplate for the rear of the spindle and a small one for the front, a rosette centre or screw chuck, large and small driving or spur centres, one cup or rail centre, a hand-rest turning holder with a right-angle rest and three others of different lengths, one floor-stand rest holder - and the necessary wrenches. 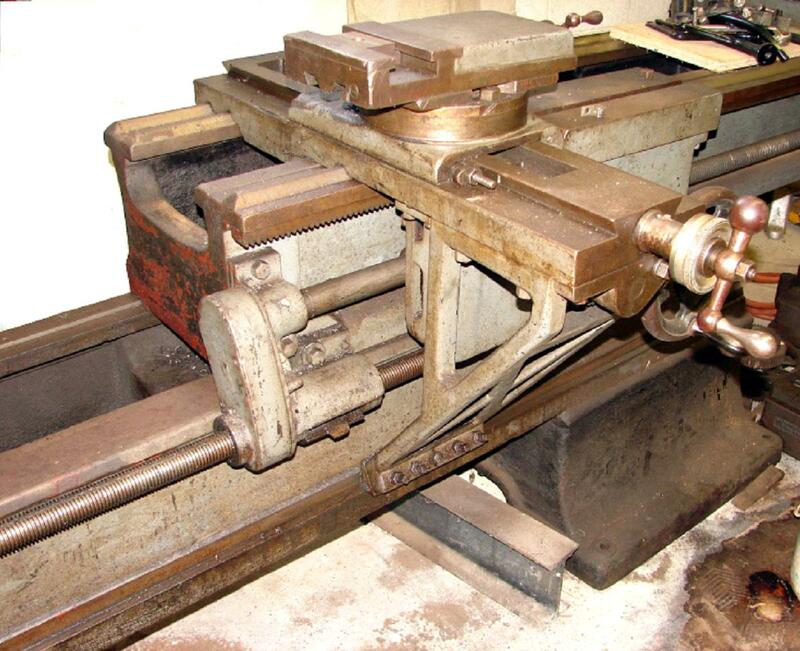 Fay and Scott also manufactured a selection of headstocks and tailstocks with swings of 12, 16 or 20 inches designed to assist the builders of home-made wood-turning lathes - these often being relatively crude devices with a wooden bed or even just bolted to a substantial bench. Metal-turning engine lathes of the sliding-bed type were given a model designation that indicated the swing over the bed and in the gap - the smallest (in the first decade of the 20th century) being the 16-32 inch, with progression through ever larger models - the 18-36 inch, 20-42 inch, 24-46 inch, 28-52 inch and 32-56 inch - to a massive 38-66 inch. As an option, the makers offered to increase the swing in the solid of all versions by an extra 4 inches, obviously a reference to packing out the casting moulds to their maximum capacity. Although all the large sliding-bed lathes incorporated an ordinary backgear system, most were also offered with the option of a double-reduction, the final drive being to a gear fastened to the inside face of a giant, T-slotted faceplate (the idea being to reduce the peripheral speed, which, on a large diameter, could be considerable). The arrangement was called, confusingly, triple gearing. Lathes with no backgear were referred to as single geared (that is, geared down by belt drive) and with an ordinary backgear as double geared. In line with the work they were expected to do - and the giant faceplates they carried - the gearing was altered according to their size: the two smallest models were given an initial ratio of 11 : 1 and, with the secondary included, an overall reduction of 32: 1. Apart from the very largest machine (geared at 12.5 : 1 and 36 : 1) all the other were set at 12 : 1 initial and 34: 1 overall. At its largest catalogues size, with a capacity of 9 feet between centres, the Model 38-66 inch weighed 14,000 lbs (6,350 kg) and needed two potable jacks to support the end of the extended bed..
* including: lathes, corn-husking machines, aircraft landing light systems, gaging & weighing machines, boring mills for Giddings & Lewis, grinders for Landis, drills, gear hobbers, M-1 carbine grenade launchers, radar units, etc…. 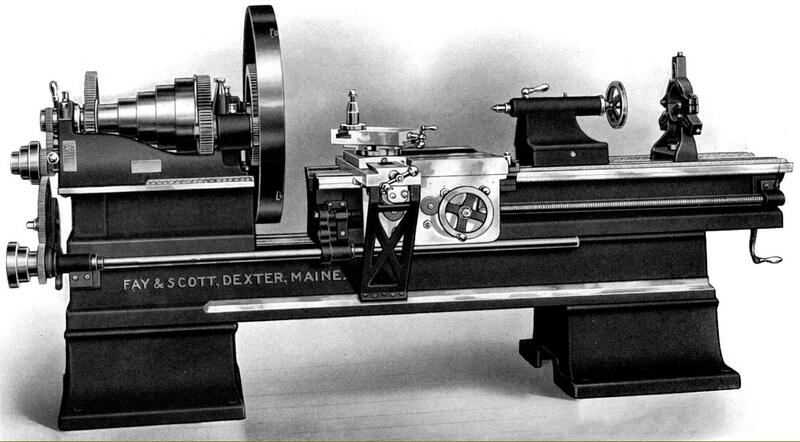 The Fay & Scott factory at Dexter, Maine, was located in the central part of the State (literally in the middle of nowhere and remote from other machine-tool makers). The company had its own foundry and concentrated on the production of lathes, having a complete line of both engine and pattern-making types. A very large capacity 90-inch Pattern Maker's Faceplate Lathe displaying a novel approach to solving the problem of adapting a relatively compact machine for both ordinary centre work and the turning of very large diameters. The lathe and its attachments weighed 5,000 lbs - and was obviously designed for serious work. The headstock bearings were 27/8" in diameter (as was the massive tailstock barrel) and 61/8" long; both the 1" bore headstock spindle and tailstock carried No. 4 Morse taper centres. The entire tailstock casting could be slid along the base plate and bolted down - but this had to be done manually, there being no form of rack or screw assistance fitted. The carriage was mounted on a separate column, itself fitted to a T-slotted base plate and adjustable over a wide range of positions to enable both inside and outside cuts to be taken. If even larger diameters needed to be turned, a faceplate could be fitted to the left-hand end of the spindle and a pit dug in the floor to accommodate the work. The separate rest provided for this (undoubtedly entertaining) exercise carried either a socket to take a T rest, or a toolholder on a compound slide rest. 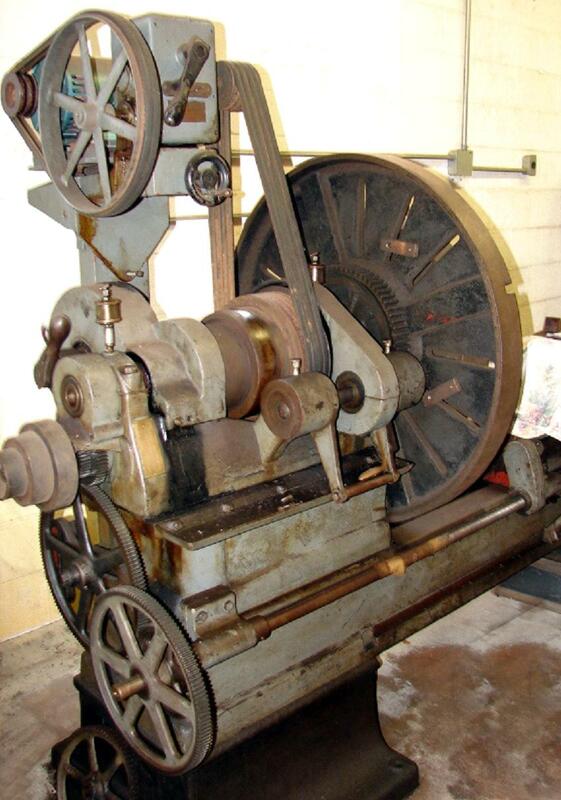 Whilst these lathes were undoubtedly built to order (and the bed plate could be specified in any length the customer desired) one of the few options listed was a "gear-cutting attachment". This was a relatively common edition to this type of commercial lathe and used to prepare patterns for the manufacture of cast gears. Providing the castings were fine enough the gears could be used in cheaper machinery without having to touch the teeth and, as a consequence (until the late 1930s), it was not unusual to see lathe makers advertising their products as having gears "cut from the solid" or with "properly hobbed teeth" to distinguish them from their cheaper rivals. The baby of the range: Fay & Scott's 10-inch Pattern Maker's Plain Lathe, designed for lighter work and use by "Manual Training Schools". With a specified countershaft speed of 800 rpm the headstock spindle would have turned at 3200 rpm on top speed - and 800 rpm on bottom. The bed could be ordered in lengths of 4, 6 and 8 feet, with the 4 foot model accommodating 24 inches between centres and weighing 375 lbs. 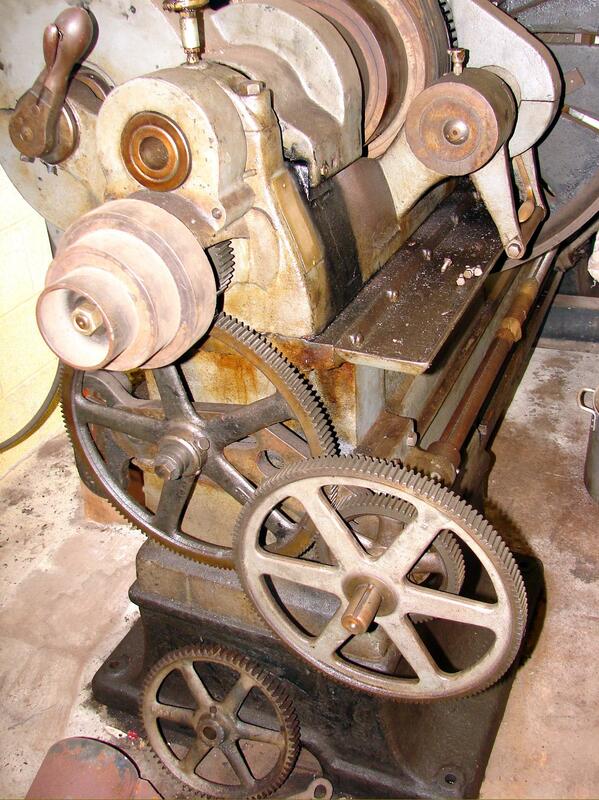 Fay & Scott's 16 and 18-inch Pattern Maker's Lathe with rack-feed carriage and compound slide rest. This was a strong plain lathe with the 9/16" bore No. 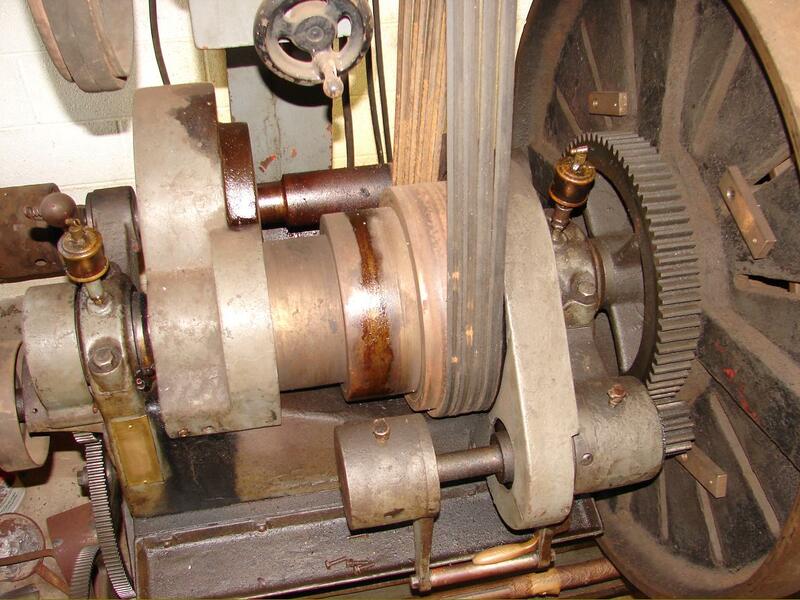 2 Morse taper headstock spindle running in bearings with a diameter of 111/16" and a length of 31/2"
The two-speed countershaft ran at 700 and 85 rpm providing a total of eight speeds which spanned a very useful 80 to 2450 rpm. The bed could be ordered in any length, in intervals of even feet, with a six-foot long bed giving a between-centres capacity of 42 inches and a weight of 800 lbs. Each extra foot of bed added 50 lbs. Fay & Scott 36 to 60-inch Extending Gap Pattern Maker's Lathe. As was usual with Fay & Scott lathes this type was available with a choice of centre heights, either 30" without the swivelling headstock, 36" with it or, to special order and including an extra-heavy bed, 42". The design was ingenious, with a separate sliding bed that could be positioned by means of a screw and handwheel; the bed was locked to the massive base casting by the two levers seen hanging just below the horizontal. With the bed closed right up to the headstock the 10-foot version admitted 41/2 feet between the headstock and rack-feed tailstock - and when fully extended 81/2 feet. As the bed was moved outwards a pair of loose jacks (supplied by Fay & Scott) had to be positioned under the tailstock end to support it. The gap admitted, relative to the preciously-mentioned centre heights, diameters of 54 inches, 60 inches or 70 inches - and of course, as the bed was drawn out, its length capacity increased as well. The beds could be ordered in any even floor length, with the 10 foot version weighing, depending upon the centre height, between 6000 and 7000 lbs. Interestingly, when turning larger diameters, the lathe was designed to run backwards, with the turning tool supported on brackets fastened to the back of the bed. The saddle was also extended backwards, and supported by a bracket fastened to its underside and sliding in a recess machined in the bottom bed. The extended portion of the apron carried a screw-feed that was able to drive a slide rest along the back bracket; ingenious …..
With a single-speed drive from the electric motor, the countershaft could be ordered with a reversing mechanism that reduced the spindle speed by a factor of 3. 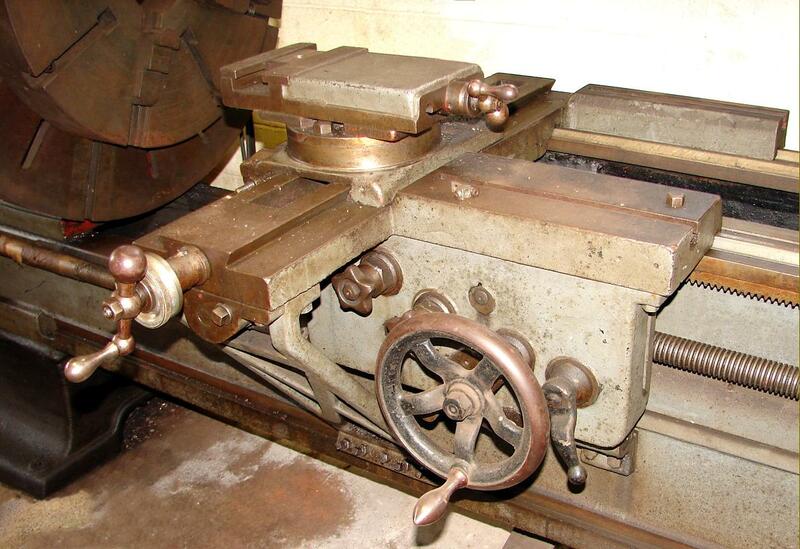 The two sizes of lathe were identical, save for the centre height and the absence of a swivel plate under the headstock of the smaller machine. 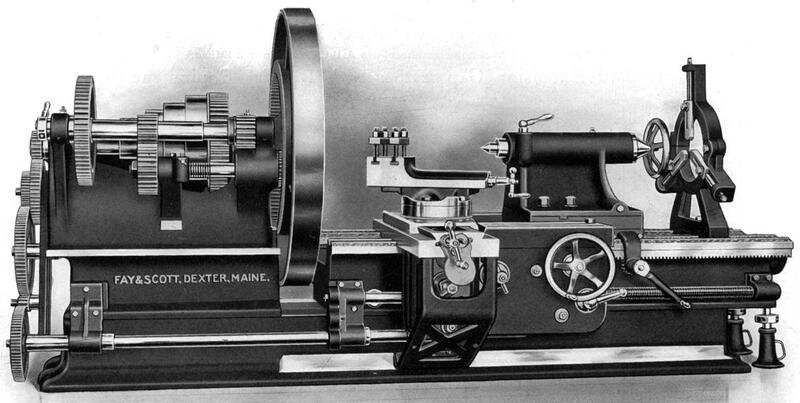 The two sizes of lathe were again identical, apart from the centre height and the absence of a swivel plate under the headstock of the smaller machine. The 36-inch version could also be ordered with a 42-inch swing, in which case a heavier bed was supplied as well. Belt-drive power feed to the carriage was not standard on this lathe, but an extra; the feed could be reversed in direction by a knob on the front of the apron. The largest model offered for regular delivery in the early years of the 20th century was the massive Model 38-66-inch. 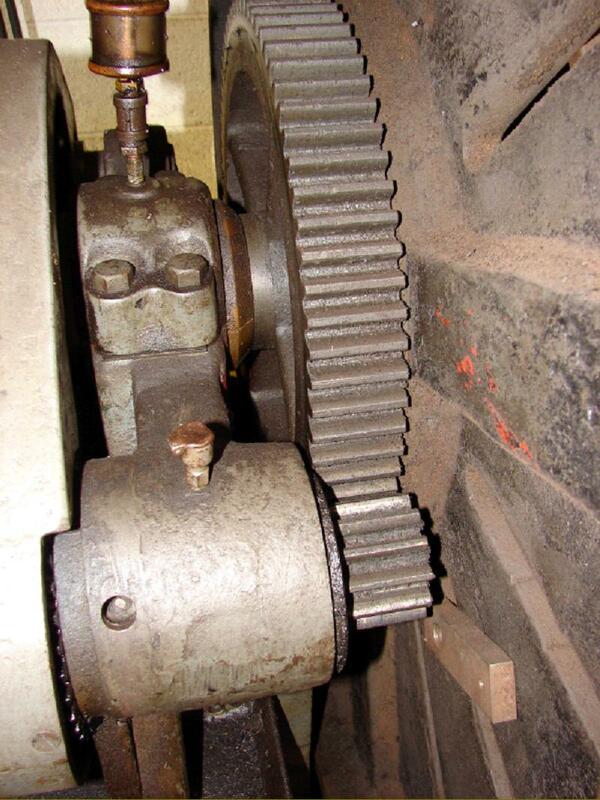 The backgearing have a reduction of 12.5 to one on its first stage and 36 to 1 on the second. As part of the regular equipment, the lathe was fitted with power feed to the top slide. The headstocks were heavily built and used bronze bearings (often referred to as "boxes" in contemporary literature) with lubrication from oil sumps within the casting; the oil was raised into the bearings through a wick which dipped into the oil. This method ensured that, should any dirt work its way into the sump, it was impossible for it to be drawn up into the bearings - only clean oil was supplied. The spindle end thrust was taken against a screwed ring, fibre washers being imposed between it and the bearing surface. Floor stand for use with the outside bowl-turning faceplate. Fay and Scott also manufactured a selection of items designed to assist the builders of home-made wood-turning lathes. The headstocks and tailstocks were made with swings of 12, 16 or 20 inches - and were often crudely fastened to a wooden bed of great length, or simply bolted to a substantial bench. 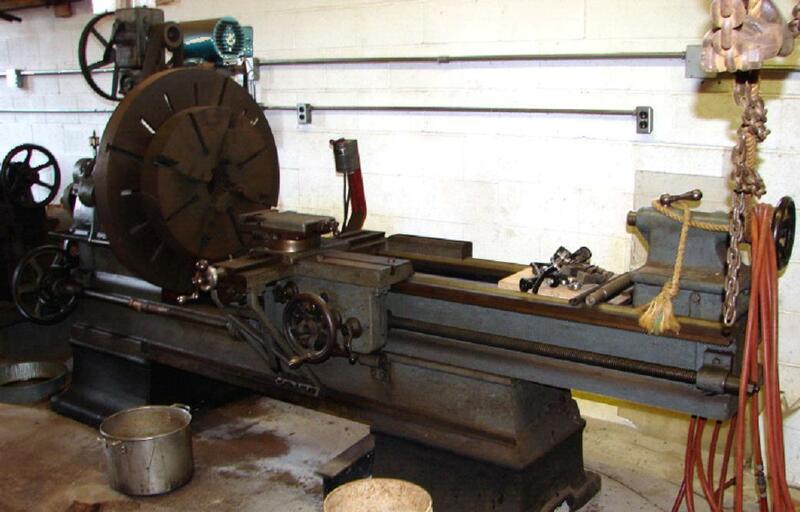 Large Fay & Scott sliding-bed lathe with triple gearing on the headstock. Some time and effort has gone into ensuring that this most useful lathe could stay in active service. The built-on drive system uses a rear-mounted motor driving to a 2-speed gearbox and then down to the largest of the headstock pulleys. 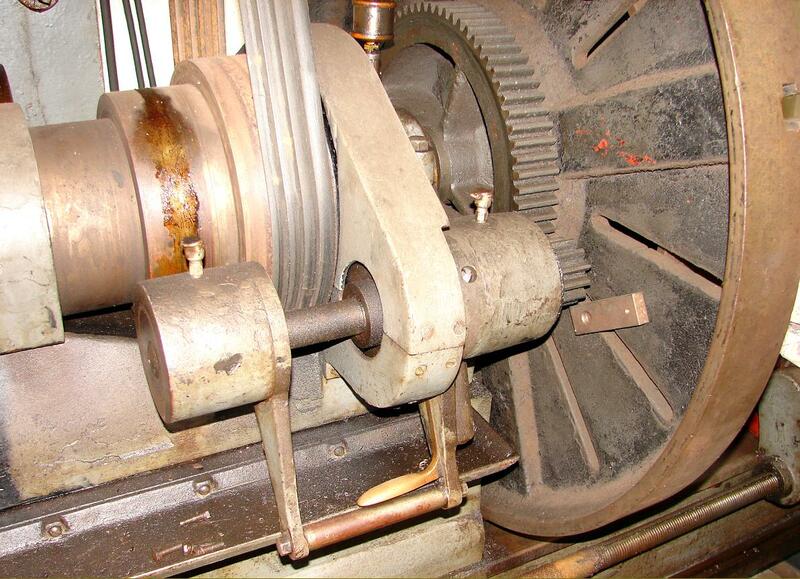 Note the use of V-belts on the flat pulleys; despite its appearance, this can be a surprisingly effective arrangement. Changewheel drive to the leadscrew. Note the positive, spring-loaded lock on the handle used to engage backgear.